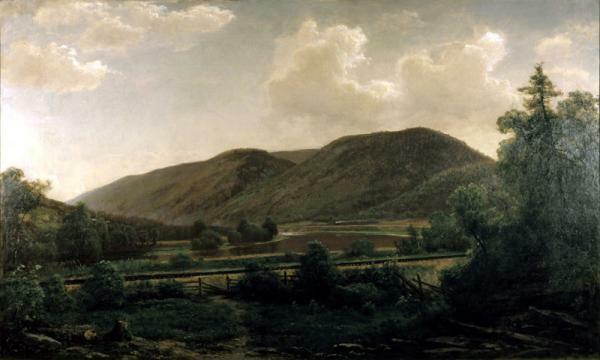 Juniata River near Lewistown, by George Hetzel, 1873. Juniata River near Lewistown, 1873, by George Hetzel (1826-1899). Born in Alsace, France in 1826, Hetzel came to Pittsburgh when he was two. He was apprenticed to a house and sign painter when he was a young boy and later gained experience as a muralist for riverboats and cafes. He joined a group of Pittsburgh painters, at the mountain retreat called Scalp Level, where he began to paint landscapes. Considered one of Pennsylvania's most significant landscape, portrait, and still life painters of the nineteenth century, Hetzel painted highly detailed, realistic views of nature and used impressionistic techniques with light.